Market to Generations Y and Z more effectively by learning how to remain a relevant, appealing brand in the eyes of the most sceptical generations. How Cool Brands Stay Hot analyses Generations Y and Z, the most marketing savvy and advertising-critical generations yet. Based on five years of intensive new youth research by InSites Consulting, it provides insights into the consumer psychology and behaviour of NextGen consumers. It reveals how they think, feel and behave, offering proven strategies to market to these groups more effectively and remain a relevant, appealing brand. Featuring interviews with global marketing executives of successful brands such as the BBC, Converse, Coca-Cola, eBay and MasterCard along with case studies from companies including H&M, MTV and Diesel, it guides readers in developing the right strategies to leave a lasting business impact. How Cool Brands Stay Hot recently won the the 2012 Berry-AMA Book Prize for best book in marketing (awarded by the American Marketing Association Foundation – AMAF) and the Marketing Book of the Year 2012 Award (awarded by Expert Marketer). A professional and international jury nominated it as one of the 10 best books of 2012. Afterwards 2.153 marketers from 85 countries voted it as best marketing book of that year. Find out more about the awards. The fully revised 3rd edition of How Cool Brands Stay Hot goes beyond the discussion of Generation Y, expanding its reach with an entirely new chapter on Generation Z and a detailed analysis of the impact that issues such as recession, social media and mobile marketing have had on these consumers. Based on new figures, case studies and interviews, it provides a fresh take on what remain critical issues for anyone hoping to market to those who come after Generation X. 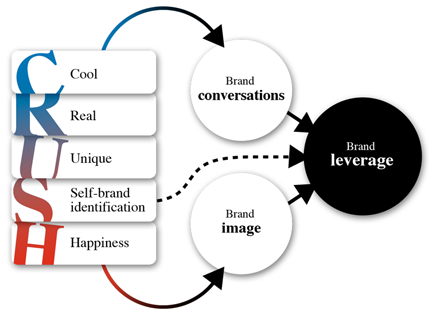 Based on years of youth research and practice with Generation Y we were able to define the 5 success factors of a youth brand, our CRUSH Branding model is the basis of the How Cool Brands Stay Hot book. Coolness: What does it mean to be a cool brand for this generation? How do you achieve a cool status and why should you bother? Realness: Brand authenticity is a key aspect that discerns long-term wining brands from fads. With Generation Y, authenticity is attained in another way than the traditional approach of claiming origin, heritage or history. Uniqueness: A clear positioning based on a sustainable brand DNA will increase impact among youngsters. This generation is craving for anchor brands in a fragmented world. But how do you assert uniqueness when most innovations are copied within a couple of months’ time? Self-identification with the brand: Gen Y’ers will only feel emotionally connected with your brand when it feels like a friend to them. This implies that your brand should reflect their diverse lifestyles. A better understanding of their identity construction will make your brand fit in with youths’ lives while embracing diversity. Happiness: Popular youth brands know how to leverage from positive emotions and avoid arousing negative ones.